A campaign to curb noise pollution Himachal Pradesh Chief Minister Jai Ram Thakur launched 'Horn not Ok' awareness campaign and 'Shaur Nahin' (no noise) mobile application in the state capital- Shimla. The campaign aims to spread awareness of unnecessary blowing horn as it creates unnecessary noise pollution and is harmful to health. The first phase of the campaign has been launched in Shimla and Manali. The mobile application is an initiative of the Department of Environment Science and Technology in association with National Informatics Centre (NIC), Himachal Pradesh. The app will enable the general public to report cases of noise pollution. It has settings for two types of users: General Public and Officers, both of whom will be authenticated with a one-time password (OTP). Complaints received through this app will be immediately made available to the concerned Deputy Commissioner, Superintendent of Police, Sub-Divisional Magistrate and Sub-Divisional Police Officer who can later respond with the action taken and report on the application itself. Q. 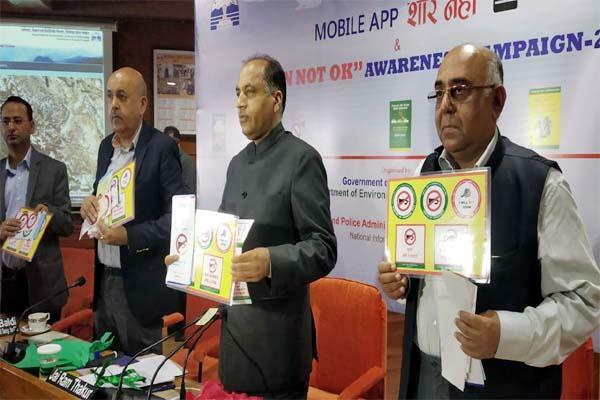 The 'Horn not Ok' awareness campaign and 'Shaur Nahin' (no noise) mobile application has been launched in which state capital?